Whether you're an expert seamstress or new to the world of sewing, you can make your own one-of-a-kind handbags using free tote bag patterns. Use free printable patterns to create everything from reusable shopping totes to high fashion head-turners. If you need help downloading the printable instructions, check out these helpful tips. Print the pattern for this flat tote. If you're a beginner, it helps to start with a simple pattern. 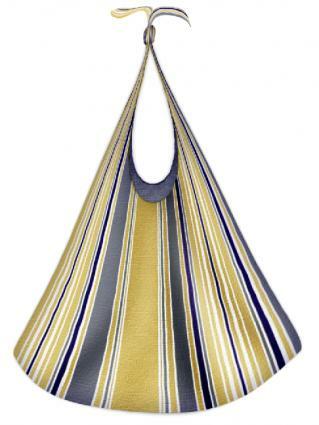 This flat tote bag is perfect for carrying a few books or even a small laptop or e-reader. Print out the pattern for the simple flat tote, and enlarge it according to the instructions. Pin the pattern pieces to your fabric, and cut two of each. Cut the piece of twill tape into two one-yard pieces. Take one piece and pin it onto the exterior fabric panel for the tote, looping it up to form a handle. Repeat with the other piece of twill tape and the other piece for the tote's exterior. Sew the handles in place by topstitching a quarter inch from the edge using your sewing machine. Stop sewing half an inch before the top of the exterior panels to allow for finishing. Stack the tote lining panels together and pin them in place. Sew a seam half an inch from the edge around both long sides, and one of the short sides. Set aside. Stack the two exterior panels together, and sew the two long sides and bottom of the tote. Allow half an inch for the seam, and be sure to catch the ends of the twill tape in the bottom seam. Turn this right side out and press with the iron. Nest the lining portion of the tote in the exterior portion. Turn the top raw edges in and pin in place. Topstitch the opening of the tote a quarter inch from the edge. Press the tote and enjoy! 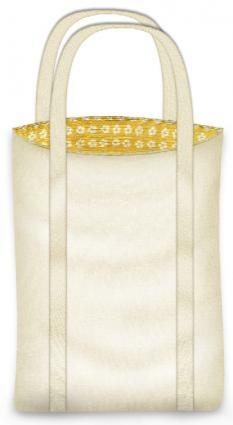 Print this free canvas tote pattern. Sometimes it's handy to have a heavyweight tote for sports equipment, toys, pet items, or beach gear. This simple pattern will help you create a basic canvas tote. Dress it up by using colorful cotton webbing. Print out the pattern for the heavy duty canvas tote, and enlarge it according to the instructions. Pin the pattern piece to your canvas fabric and cut it out. Make a narrow rolled hem on the top and bottom edges of the tote piece. Topstitch the edge to finish it. Form the cotton webbing into a loop, and pin it flat on the tote piece to create handles. You should have an even amount of webbing on the top and bottom of the tote piece. Sew the handle in place by topstitching the webbing. Fold the tote piece in half with the right sides together, matching up the notches. Pin and sew a seam all the way down each side. Turn the tote right side out. Grasp the bottom corner on one side of the tote, and locate the notch on the inside of that side of the tote. Press the bottom of the tote flat, and bring the bottom corner of the tote up against the side seam to meet the notch there. Pin it in place. Repeat with the other side. This creates a flat bottom and allows the tote to stand upright. Hand sew each corner to hold it in this position. Use your iron to crease the seams. Print the pattern for this pillowcase tote. If you love vintage linens or have a few extra pillowcases around the house, you can use this pattern to turn them into a fun tote bag. The pattern is for a standard-size pillowcase, but you can further enlarge it to use it for a king-sized pillowcase. Print out the pattern for the pillowcase tote, and enlarge it according to the instructions. Pin the pattern piece to your pillowcases, and cut them out. Nest the pillowcase pieces with their right sides together, and pin along the top edges of both. Sew along the top edge of both sides with a half-inch seam allowance, leaving an eight-inch section open for turning. Turn the pillowcase tote right side out, and iron the seam. Turn the raw edge of the open section in, and pin it in place. Topstitch a quarter inch from the edge around the entire opening and handle area. Knot the two handles together to form the tote's shoulder strap. Print the free pattern for this flower tote. Felt is a great material to work with, since it does not fray. 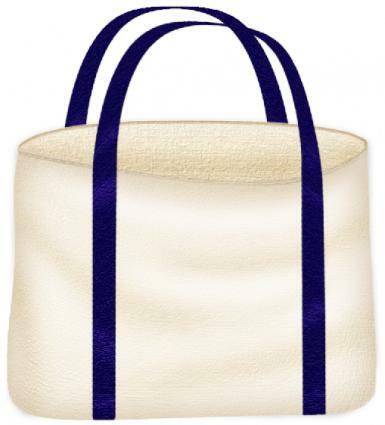 This simple flat tote is very stylish and makes a great gift. 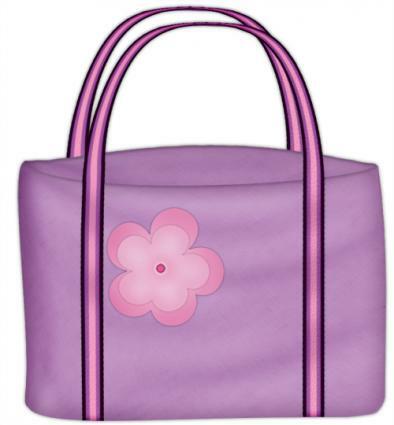 Print out the pattern for the felt flower tote, and enlarge it according to the instructions. Pin the pattern pieces to your felt fabric and cut them out. Set the flower pieces aside. Fold over the top and bottom edges of the tote piece to create a hem, and topstitch a quarter inch from the edge. Make a loop out of the cotton webbing. Pin it flat on the tote piece to create handles, leaving an even amount of webbing at the top and bottom of the tote piece. Sew the handles in place. Fold the tote piece in half, matching up the right sides. The notches should match up along each side. Pin and sew the side seams, leaving a half-inch seam allowance. Turn the piece right side out. Grasp the bottom corner on one side of the tote, and locate the notch on the inside of that side of the tote. Press the bottom of the tote flat, and bring the bottom corner of the tote up against the side seam to meet the notch there. Pin it in place. Repeat with the other side to create a flat bottom for the tote. Hand sew each corner to hold it in this position. Stack the felt flower pieces, and pin them on the tote in the desired location. Place the button on the center of the flower, and hand sew it in place. 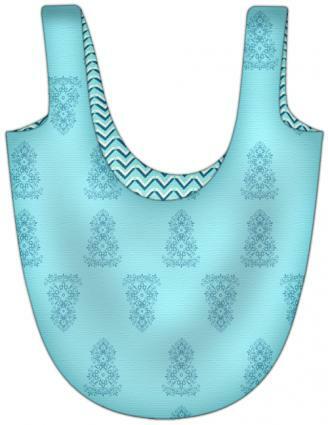 Print this free shopping tote pattern. You can reduce waste and look stylish at the same time by making this reversible shopping tote. Use simple cotton quilting fabric to keep it lightweight. When you're done shopping, simply fold up the tote and put it in your handbag. Print out the pattern piece for the reversible tote and enlarge according to the instructions. Cut two of each fabric. Arrange the exerior pieces so the right sides are together, and sew along the bottom curved seam, using a half-inch seam allowance. Repeat with the interior pieces. For each side of the exterior piece, bring the handle tops together and sew to attach. Repeat with the interior piece. Turn the exterior piece right side out. Nest the interior piece inside it. Along the top and handle loops, fold the raw edges in and pin in place. Topstitch a quarter inch from the edge. Iron the tote to finish it. Print this free pocket tote pattern. This handy tote is similar to the heavy duty canvas one, but it has an extra dose of style. 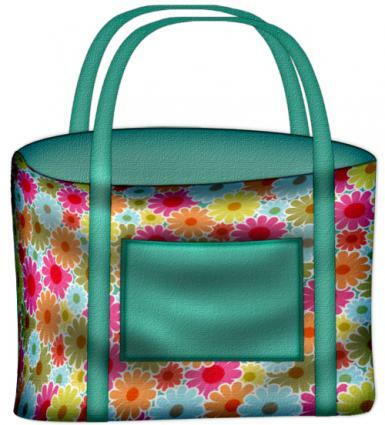 Chose fun fabrics to give this tote a trendy feel. Print out the pattern for the pocket tote, and enlarge it according to the instructions. Pin the pattern pieces to your fabric and cut them out. Pin the right sides of the pocket pieces together, and sew along the top and bottom edges. Turn this piece right side out, and iron it. Topstitch the top and bottom seams. Place the pocket on the front side of the tote, lining up the bottom of the pocket with the first notches on each side. Pin the pocket in place. Form the cotton webbing into a loop, and pin it flat on the exterior tote piece to create handles. Arrange the webbing so it completely covers the raw edges on the sides of the pocket. You should have an even amount of webbing on the top and bottom of the tote piece. Sew the handle in place by topstitching the webbing, but stop sewing half an inch from the top and bottom edges. Sew along the bottom edge of the pocket to affix it to the tote. The pocket should now be closed on three of the four sides. Fold the exterior tote piece in half with the right sides together, matching up the notches. Pin and sew a seam all the way down each side. Repeat with the interior fabric piece. Set the tote interior aside, and grasp the bottom corner on one side of the tote exterior. Locate the notch on that side of the tote. Press the bottom of the tote flat, and bring the bottom corner of the tote up against the side seam to meet the notch there. Pin it in place, and then hand sew to hold. Repeat with the other side. This creates a flat bottom and allows the tote to stand upright. Repeat with the interior fabric for the tote. Turn the exterior piece right side out, and nest the interior piece inside it. Turn the top edge in all the way around, and pin in place. Topstitch a quarter inch from the edge to finish the tote. Iron your tote, and enjoy! Remember that tote bag patterns are really just a place to start. 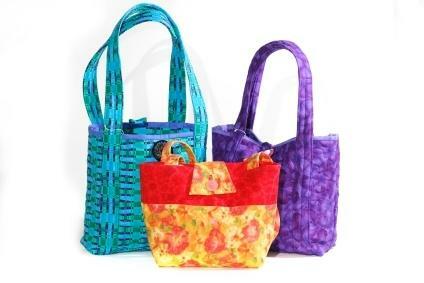 You can change the colors, patterns, and textures of fabrics you use to give your tote a unique flair. Also consider using embellishments like flowers, buttons, badges, and appliqués to add even more personality. Making your own stylish tote bags is a great way to show off your creative side.